Hewlett-Packard layoffs pushed payroll reductions to their highest level since February 2013, says Challenger, Gray & Christmas. While many employers continue to slowly add to their payrolls, others are trimming their workforces considerably. Payroll processor ADP reported on Wednesday that private sector U.S. employment rose by 179,000 jobs in May. What ADP didn’t say was that, according to outplacement consultancy Challenger, Gray & Christmas, U.S. companies and governments cut 52,961 jobs. The announced job cuts represent the highest monthly total since February 2013, when 55,356 job cuts were recorded, says Challenger. The number of payroll reductions were 31 percent higher than a year ago and increased for the second consecutive month (see chart at bottom of story). The top reasons for May’s job cuts, said Challenger, Gray & Christmas, were restructurings, business closings, cost cutting and demand downturns. On Wednesday, the Federal Reserve reported in its Beige Book that labor market conditions had “generally improved” since its April economic report. Several of the Fed districts reported that “employers were having difficulty finding skilled workers,” and that wage pressures in some fields were rising as a result. The Bureau of Labor Statistics reveals its job growth numbers on Friday. Economists expect employers added 210,000 jobs but forecast that the unemployment rate would inch up to 6.4 percent. 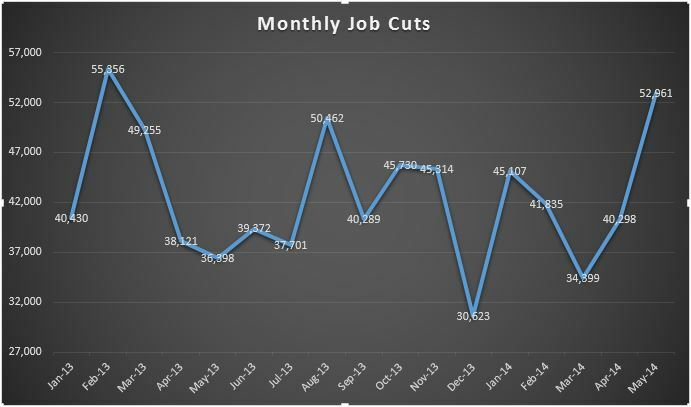 Source: 2014 May Job Cuts: 52,961 Highest Monthly Total in 15 Months | Challenger, Gray & Christmas, Inc.
Accounting professionals will continue to benefit from high demand as companies rebound from the recession, survey says.